"I shall bless all hearts on earth who spread devotion to my Green Scapular. It is my Immaculate Heart." 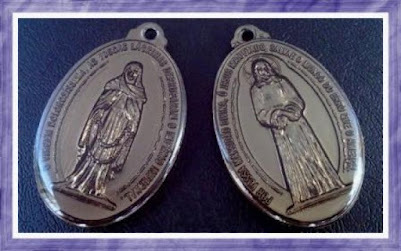 Sister Justine Bisqueburu was our Lady's choice for the Green Scapular, as Sister Catherine was her choice for the Medal of the Immaculate Conception. They were contemporaneous Sisters of Charity of St. Vincent de Paul. In contrast to Sister Labouré's oblivious retirement, Sister Bisqueburu was to head military hospitals in Paris and Algiers, she was to be seen spending three days and three nights on the battlefield of Mentana, would organize ambulance corps in Rome, and accompany Pius IX on walks in his private garden. Almost nothing is known of her life prior to her entry into the Sisters of Charity. Two coincidences stand out in the foreground of her career: on her journey from Pau to Paris to embrace the religious life, she was accompanied by Father Aladel, her future spiritual director, who had also been the director of Sister Catherine Labouré. She entered the seminary there on November 27,1839, on the ninth anniversary of our Lady's Miraculous Medal apparition to St. Catherine. 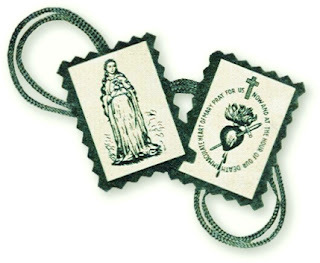 The green scapular, or "Badge of the Immaculate Heart of Mary," as it is variously called, was to be an instrument for the Daughters of Charity to be used in the conversion of sinners and infidels, especially in the matter of obtaining for them the grace of a happy death, Sister Justine was told. The interior voice also made known to her that they were to be made and distributed as soon as possible. 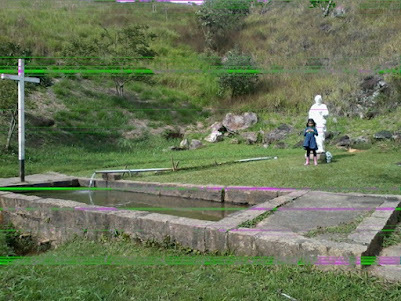 The report of the apparition and the requests of our Lady were reported to Sister Justine's superior with the utmost of caution and deference. "It is absolutely necessary that Father Aladel attend to the Scapular, that he should disseminate it and do so with confidence. Heretofore, I am sure, he did not attach great importance to it. He was very wrong. True, I do not deserve to be believed, for I am only a poor girl in every respect. May I entreat him to do this, not for my sake, but I ask him in the name of Mary to do it for these poor souls who die without knowing the true religion; yes, if it be givenwith confidence, there will be a great number of conversions. ...Answer me, I beg of you, as soon as possible; we cannot lose any time." 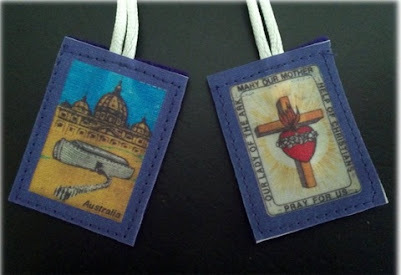 In the case of sinners or infidels, the scapular could be placed in a bed or room, or sewn or slipped unknown to the person into his clothing, and the benefactor could say the prayer in his stead. Different kinds of rays fell from the Blessed Virgin's hands in the vision, signifying that the graces obtained from its use would be greater or less in proportion to the degree of confidence on the part of the devotee. 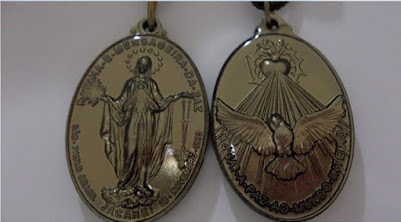 Subsequent approval was climaxed by the favorable reception of the scapular by Pope Pius XI, who placed the scapular on his desk with the Miraculous Medal. "Jesus wishes His Sacred Heart honored in union with my Immaculate Heart." "You have just seen hell where the souls of sinners will suffer forever. To save souls from hell, God wishes to establish in the world devotion to my Immaculate Heart." 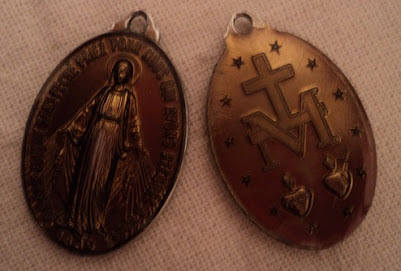 The Immaculate Conception was heralded with Catherine Labouré and her Medal; it appeared with the Sacred Heart of Jesus on the back of the medal. 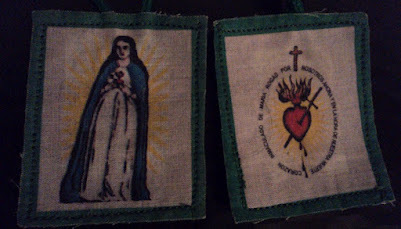 The Immaculate Heart of Mary was proclaimed again with the Green Scapular; likewise the Sacred Heart of Jesus and Mary were correlated on the back of the scapular. The reverse of the medal consisted of a large "M" surmounted by a cross upright on a bar supported by the letter. Beneath the letter was the Sacred Heart on the left, crowned with thorns and across rising out of flames issuing from the top; the Immaculate Heart of Mary as on the Green Scapular was to the right, pierced with a sword, and the same flames rising forth. All was encircled by a diadem of twelve stars. St. John speaks in the Apocalypse of the "Woman clothed with the sun, the moon under her feet, and on her head a crown of twelve stars.' She had come! The particular power of this scapular is to help in the conversion of sinners, and in obtaining for them the grace of a happy death. To complete the correlation there was the red scapular, given during the same period to another Sister of Charity. 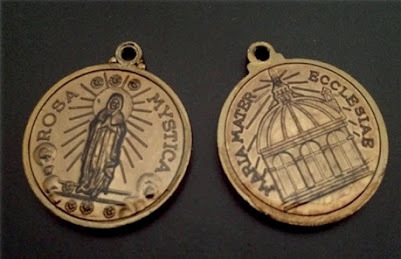 On July 29, 1846, another Daughter of Charity, Sister Appoline Andriveau, was favored by an apparition of our Lord, Who revealed to her a new scapular of a red color, on which, next to His Heart, was also that of His Mother, and which for this reason received the name of Scapular of the Sacred Hearts of Jesus and Mary. Our Lady was building the edifice of devotion to her Immaculate Heart to save souls from hell with many means, long before her greatest plea at Fatima in 1917. The Marian Age was speedily under way; the opening strokes were completed; the essential cores were wound and energized. -from Recent Apparitions of the Blessed Virgin Mary, by Stephen Breen. 3. 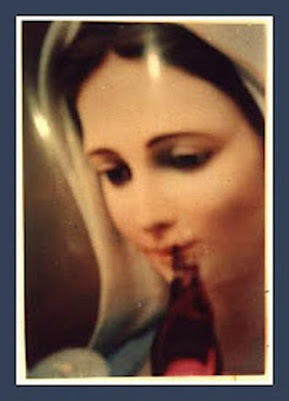 Pray, at least daily: "Immaculate Heart of Mary, pray for us now and at the hour of our death"
"The greatest graces come from using the scapular but these graces come in direct proportion to the degree of confidence in me which the user has." 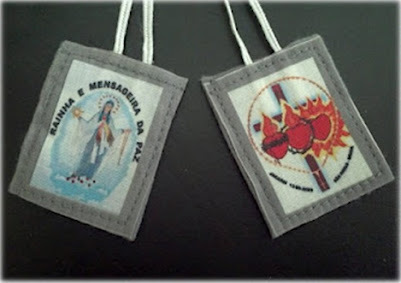 In Jacarei´s Apparitions, Our Lady asked that everybody should use the Scapular which She had reveled on her Apparitions. These sacramental should be used together.